The school serves society not only through the education it provides to future citizens but also by providing support to deserving causes that are worthy of the efforts and engagement of its students. Mayoor School espouses and furthers the philosophy of ‘Ubuntu’, whose hallmark is ‘sharing’. Mayoor School provides assistance to Meenu Manovikas Mandir, Ajmer, which is a voluntary organisation working for the rehabilitation of children with special needs. The staff and students associated with the Global Citizens’ Club of Mayoor School frequently visit Meenu Manovikas Mandir. The club organises innovative activities to nurture children facing disabling conditions. This sensitizes the students of Mayoor School towards people with special needs. In 2015, the Global Citizens’ Club designed and gifted a special “Sensory Board” made of wood covered with ridges, grooves, geometrical shapes, colours, abacus etc. to Meenu Manovikas Mandir to aid in the improvement of sensory detection, motor skills and processing in the students. Mayoor School is committed to strengthen the social participation of children with special needs. The students of Meenu Manovikas Mandir are invited to Mayoor School fete where the Mayoorites volunteer to take care of them. The money collected from sale of raffle tickets is donated to the school. Further donations include items of everyday use. Mayoor School Ajmer provides assistance to Badhir Vidyalaya, Ajmer which serves the noble cause of educating children affected by disabling hearing impairment. We have supported Badhir Vidyalaya in infrastructure development that includes renovation of classrooms. Further assistance includes purchase of Badhir Vidyalaya’s fete tickets. Mayoor Summer School is sponsored every year by the school on commencement of summer vacations. The month-long Summer School gives an opportunity to the students of all age groups to be in their element whilst indulging in fun activities. Summer School is a favourable way to utilize the vacation time for creativity flow and learning new skills and techniques in Sports, Performing and Visual Arts, Computers and Robotics. Mayoor Summer School is open not only for the Mayoorites but also for their parents and siblings. Blood Donation is a humanitarian act for saving lives. Mayoor School realizes its social responsibility for spreading awareness about the importance of blood donation and hence organises an annual blood donation camp in which the willing parents and teachers participate. Mayoor School, Ajmer is in the process of formalising and documenting its ‘Cleanliness Curriculum’ to create sensitivity and awareness among each member of its community, to clean up and maintain cleanliness, not only in their surroundings but also their city and their state and ultimately their country. Among other initiatives that the school envisages, is the cleaning up of a part of the city which is particularly dirty every Wednesday in the one hour CCA lesson. 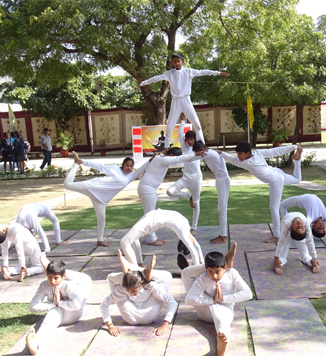 One Co - Curricular Activity Club from among the 35 odd clubs the school runs by turn go to a particular area of Ajmer and clean it up. The students and the teachers wear masks and gloves and collect the rubbish in gunny bags which are then disposed off in the Municipal dust bins.